Property 1 is a 2.2 acre property that sold in July of 2012 for $9,699 on Desert Flower Rd (approximately .6 miles east of Highway 395). This owner purchased the property for $4,395 per acre. 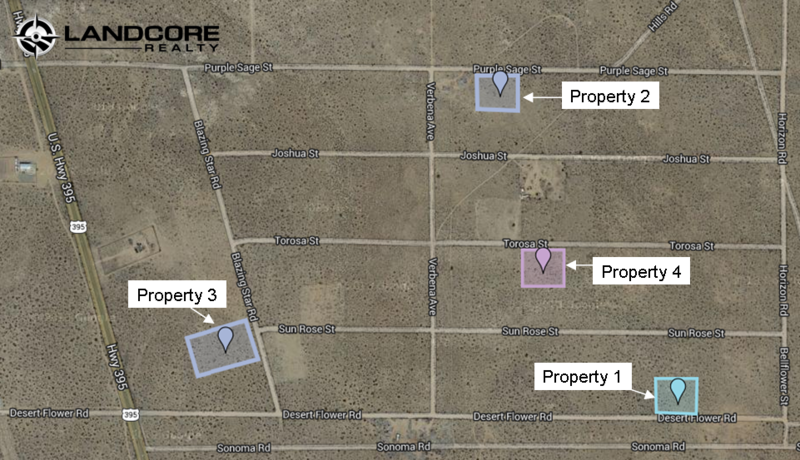 Property 2 is a 2.21 acre property, slightly north that sold in December of 2013 for $4,000 on Purple Sage St. approximately .7 miles east of Highway 395. This owner purchased the property for $1,810 per acre. Property 3 is a 3.79 acre property that sold in July of 2013 for $24,500 on Blazing Star Rd. approx 550 feet from Highway 395. This property has electricity nearby (at a home approximately 660 feet northwest of its location). Also, this property is substantially closer to the highway that the others. This owner purchased the property for $6,464 per acre. Property 4 is a 2.28 acre property that sold March of 2014 for $97,000 on Torosa St. approximately .6 miles east of Highway 395. This owner purchased the property for $42,543 per acre. Now we may not know all the circumstances surrounding the sale of property 4, but from the information gathered from the county records this is an unusually high price per acre. The surrounding property sales values show a substantially lesser value. So what does this mean? Knowing the sales price of other nearby properties or having a great real estate salesperson to do that for you is invaluable before purchasing an investment property. There are sellers that will take advantage of a buyers lack of information or skill in a real estate transaction. Please make sure you are working with a great real estate salesperson or broker who is knowledgeable in your area, knowing the pertinent information could save you money.